The Cell Metric® is a high resolution bench-top imaging system specifically designed to speed up Cell Line Development (CLD). The most time-consuming and challenging stage of cell line development is that of achieving mono-clonality, i.e. proving that the resultant cell line is derived from a single cell. Typically this involves several lengthy rounds of sub-cloning and investment, but now this work has been simplified by Cell Metric®. The Cell Metric’s® unique cell imaging and image analysis capabilities enable fast, unequivocal identification, qualification and tracking of single cell derived clones. Using high resolution imaging of every well seeded during single cell cloning, individual cells can be clearly identified and documented at day 1 followed by monitoring of subsequent colony formation through regular imaging. The Cell Metric® uses non-invasive brightfield imaging for analysis of settled suspension or adherent cells. 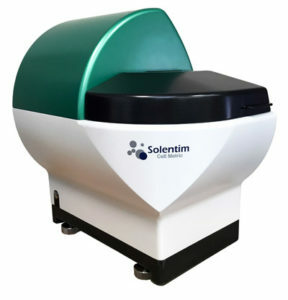 The Cell Metric® instrument from Solentim offers an alternative approach for ensuring cell line monoclonality. This semi-automated image documentation can be used to prove and document mono-clonality in a regulatory compliant manner by providing a permanent record of evidence with photo documentation of cell growth and development from day 1. Cells are imaged in lidded, flat-bottomed microplates (384, 96, 24, 6-well) in their normal liquid media environment. Plates are loaded manually into the instrument and software set-up takes seconds. Scanning of the entire plate is rapid ( from less than 3 mins) with whole-well images captured automatically at single-cell resolution. Results are reviewed on the instrument computer or at your desktop using the remote viewer software. Simple analysis and heat maps of plates quickly drill down to the wells of interest. Tracking of wells together with the associated images and data allows you to manage your workflow. The Cell Metric® can now be purchased with fluorescence detection features that enable the user to validate a new a seeding method or quality check their existing method. The factory fitted feature provides the user with the option to use red or green fluorescence channels, together or separately, for the method qualification and the outputs generated allow for either quick review of their seeding performance by the user or provide statistics available for export and further details data analysis.